It's the name of a postcard-perfect town in Connecticut. From its quaint gazebo to its white-steepled church and village green, Keepsake is the kind of place most would love to call home. It's home to Olivia Bennett, the town princess who has a charming shop there. It was home once to Quinn Leary, the son of her family's gardener: Quinn fled as a teenager with his father who was accused of a murder he didn't commit. And Keepsake is home, still, to someone with mayhem on his mind. When Quinn returns after an absence of seventeen years, he has one desire: to prove his father's innocence. It's not until he sees his childhood school rival, now a grown woman, that he realizes he harbors another but equally passionate desire--and that the two are tragically at odds.
" By now, the secret is out that Antoinette Stockenberg is one hell of a writer. Her latest romantic intrigue, KEEPSAKE, lives up to its name as well as the previous works of the author by being a keeper. The story line is fast-paced and reflects a small New England town as few books do. Olivia is a warm, intelligent individual while everyone will jump for joy after reading about Quinn. If a romance reader has not tasted Ms. Stockenberg, they are missing some of the best works of the last few years. " " Sparks fly ... highly charged ... a dynamite romance to die for. This is exciting reading that keeps you guessing right up until the end. Give yourself plenty of time to read this since once started it is hard to put down. First rate! Ms. Stockenberg pulls out all the stops with hot, sizzling love scenes as well as some real heartbreakers that make you reach for the hankie box ... a voice to be reckoned with." " When you've got it, flaunt it, and KEEPSAKE has it all: passion, mystery, suspense, and characters that instantly endear. A standing ovation for Antoinette Stockenberg." " Antoinette Stockenberg is writing some of the smartest, sassiest, and sexiest contemporary romances around." "Ms. Stockenberg does a stellar job breathing life into this absorbing story that probes deep into the painful heart of a small community. KEEPSAKE is a keeper!" 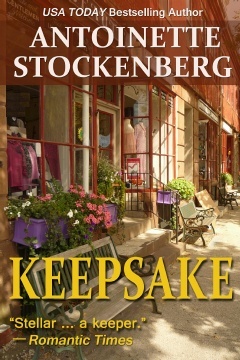 "KEEPSAKE is a deeply emotional tale of love and life in a small New England town--with all of its secrets, prejudices, unforgettable characters, and charm--interwoven with a murder mystery that has a surprising solution. A fine offering from an author worthy of keeping an eye on." " Success on a grand scale ... gloriously alive with fresh writing and an intriguing story, this novel goes straight to the heart with its tale of love lost and found, and a seventeen year-old murder that screams to be solved."